If you’ve been following me here, make sure to change things up and come over to http://www.katyflint.com! This site will soon be gone! 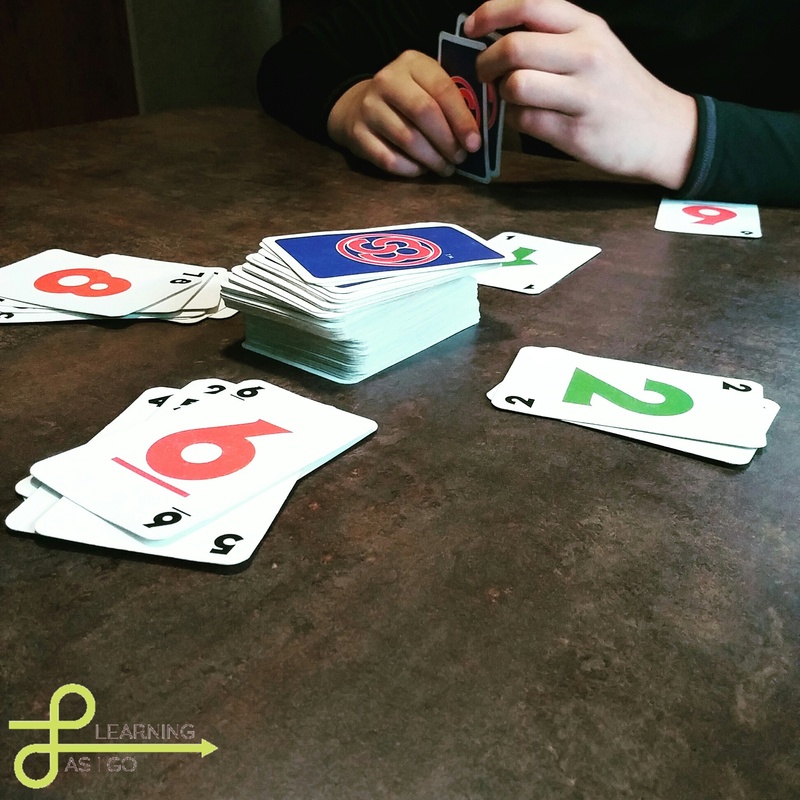 Several games of Skip-Bo and a couple movies is how we spent our morning! camping, LIVES for this time of year and camping, so here we are…in the rain, smiling even though I’m so tired and want to go home! Memorial Day weekend is coming up and if you know anything about camping, this is a HUGE camping weekend! Reservations for a spot at Beeds Lake State Park (right outside our hometown) happened back in February when the Iowa DNR opened up reservations for the season! It will be jam packed that weekend! The boys aren’t technically scheduled to be with us that weekend, but camping at Beeds Lake with friends and family is a tradition, so they are choosing to come with us. We don’t venture too far away on Memorial Day as we usually have baseball games scheduled and we never know T’s schedule with field work and farmer support! So, now that I know we’ll be there for 3 nights and 2 full days the planning must begin! (Yes, we are only about 3 miles from home, but what’s the fun in camping if you’re constantly going back forth!) Here is how I prep for several days of camping (especially with kids)! make sure I have a “main dish” for each of those! I fill in around the sides. Now, this doesn’t mean we have to eat these meals on certain days, but I want to make sure I have enough food for meals and snacks of course! 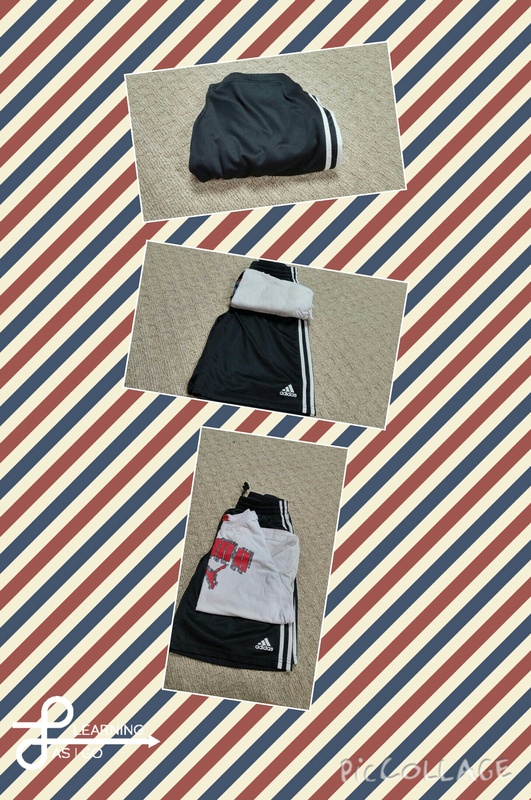 Clothes packs make it easy for kids to get dressed by themselves while camping! dressed without disturbing anyone else. No need for me to worry or monitor matching of clothes because let’s face it…guys don’t really care! I do and don’t want the boys looking like homeless children, so…I have everything prematched and no fear! I then place these in a tub or on hanging shelves that we have put in their closet. 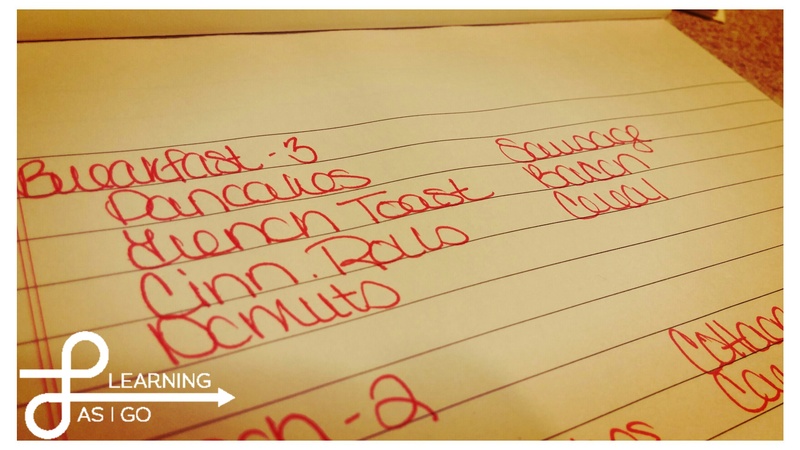 Make Lists – I know this seems like a no-brainer, but I typically make at least 2 lists. I make the list of items to get from the grocery store and I make a list of things that need to be taken from the house. That list might include perishables that we don’t pack ahead of time in the camper, the dog dish, food for the dog, a lighter for starting fires, etc. Again, it seems like an easy one, but does help make the final steps of leaving home much smoother. We actually have a list started already from 2 weeks ago when we went camping! Know Your Role – This is something that T and I have fallen into without even trying, but it works so well. We both know what each other is taking care of without even really discussing it! He takes care of filling the camper with water, loading the truck with fire wood, getting fishing poles, bikes, etc. I’m responsible for clothes and food. Then, the rest of it we work together on. Similarly he hooks the camper to the truck, I lift the 4 corner jacks, same when we get to our site…we have a routine. Find a routing that works well for your family and stick with it every time you camp. While camping is never without hiccups, these four simple steps can help ensure that it goes smooth and with as few as hiccups as possible! Have a great holiday weekend! So, how many hats do I wear? Well, this week for example I am a City Clerk (my full-time big-girl job), wife, step-mom, daughter, daughter-in-law, Norwex consultant, social media expert, and Jamberry Nails consultant. Whew, I’m exhausted! So, why do I “do” all these things? Well, to be honest, I’ve gained so many great skills and experiences, that I can’t help it! Let’s look at these individually! City Clerk – I kind of fell into this job! Ok, well, pushed really! I was unhappy in my previous job, burned out really, and T basically forced (not really, but I like to tell people he did) me to apply! So, here I am! I love the job and the people that I’ve met while doing it. The experiences and skills that I’ve gained. But, the why? Well, to be honest…I helping to raise 2 very active, fast growing boys…they are not cheap to feed!!! Wife – I do this because I found that person who complimented me! He is calm when I’m not, he is strong when I am not, and we make a fantastic team! I’ve also gained skills from being married: negotiating, compromising, patience, growth, etc. Step-Mom – oh boy…talk about learning! I have learned that I can love someone who I did not give birth to, more than I love myself! I’ve learned selflessness and patience, gratitude and strength! Direct Sales Consultant – I not only have developed my people skills even more so than before, but I’ve also developed a sense of worth by doing “extra” to provide for my family as well as gaining friendships that will last for a long time! My communication has also been challenged and I’ve been forced to learn different ways to not only read people, but how to respond. Obviously I’m a daughter, daughter-in-law, and the rest that I listed by default of the other hats that I wear, but it doesn’t mean that those hats haven’t taught me several lessons and have helped me to develop all the other skills that I listed previously. While some days I’m so busy my own head spins and I feel like my list of “to do’s” is never ending, but I am grateful for the experiences and hats that have been brought into my life. What hats do you wear?? What have you learned from your different hats? If you’d like to connect with me on my other Social Media profiles, you can click the links below! Did you know it’s Beef Month? Thanks to Shannon over at Enchanted Acres, I do now! We are lucky enough to be able to purchase our beef from friends, who are farmers! We purchase it a half at a time (which means we get a half of a cow processed at a local locker)! Our favorite locker is Lewright Meats in Eagle Grove, IA! This also means that we can have cuts of meats that we don’t eat as often as others! Ground beef goes REALLY fast in our house, steaks are close behind. Roasts…slowly bring up the tail end. So, I’ve been hunting for recipes to use with roast beef. Last month I introduced Shredded Beef Tostadas! The good news? I thought they were fantastic and the shredded beef that I concocted was melt in your mouth good. The bad news? T thought the tostadas were too messy and hard to eat! So, I thought to myself…how can I use this mexi-beef in another dish? 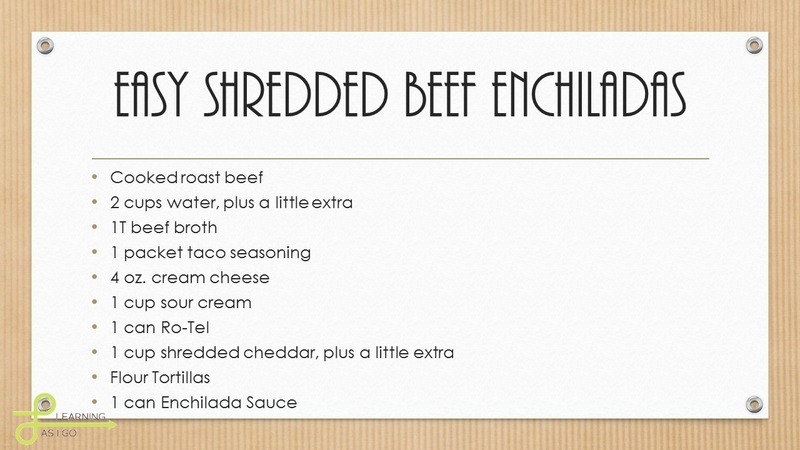 So, without further adeau, Easy Shredded Beef Enchiladas! Begin with your already cooked roast and shred it into pieces that your family will enjoy eating! (My guys like smaller pieces.) Place in a small crock post (I used the appetizer size crock pot and it was almost full.) Boil 2 cups of water and dissolve the taco seasoning and beef soup base in the water and pour over the shredded beef. (If all the beef is not covered with liquid, add just enough water to do so.) Let this simmer for at least 4 hours, but the longer the better. Once the meat has simmered, drain the liquid off and let it cool. Drain the can of Ro-Tel and then in a small bowl combine the cream cheese, sour cream, and about 1/2-3/4 can of Ro-Tel. Combine until smooth and then stir in about one cup of cheddar cheese. Then, it’s time to assemble your enchiladas. Spread about 2T of the cheese mixture along the center of a flour tortilla, add about 1/3 cup of the shredded beef on top of the cheese mixture and roll up! Place in pan and cover with foil. Bake at 350 for about 20 minutes or until the the enchiladas are hot throughout. 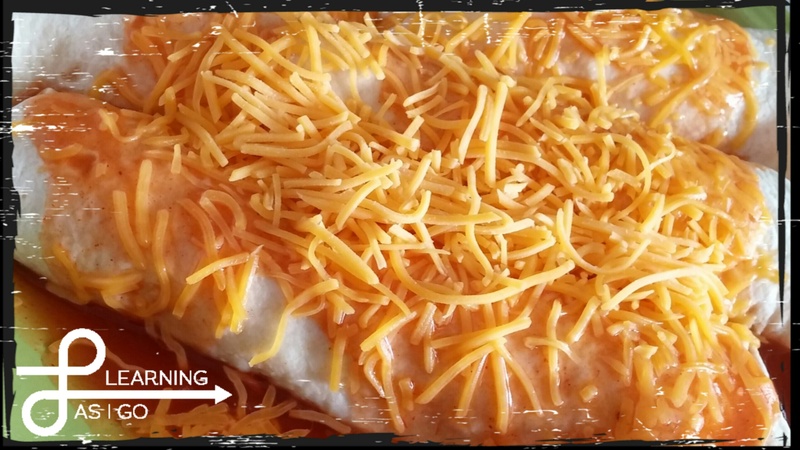 Remove from the oven and pour Enchilada suace over and top with more cheddar cheese. Place under a hot broiler until the cheese is melted! These enchiladas are not super spicy, so if you prefer things with a bit more kick, add some spices to fit your heat level preference. I hope you enjoy the enchiladas as much as we did!